How old Hwy. 89 has survived, thrived and stayed alive. When it comes to roads that impress based on colossal length alone, U.S. Route 20 has all the rest of them beat with its 3,365 miles of breathtaking asphalt. 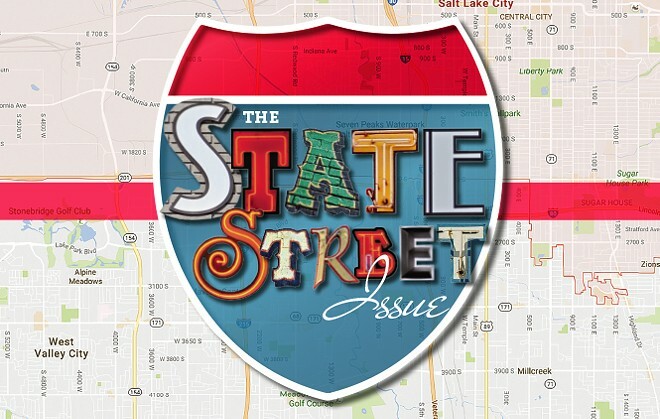 Even with the mighty U.S. Route 89 helping out girth-wise, State Street pales in comparison; but in its 17.3 miles—spanning from the Capitol building to Draper—the story of Salt Lake City is contained. State Street's reach, however, goes far beyond that. Take for instance Salt Lake Community College, which in total is responsible for helping mold the future of 61,000 students a year; Impact Hub, which encompasses 13,000 square feet of entrepreneurial coworking space; or Little World Chinese Restaurant, where I have never been judged when ordering a large house special chow mein (for one) on an idle Thursday at 9:45 p.m.
From its deep-running history to its ingrained seediness, Salt Lake City's essence calls State Street home. A few years shy of turning 100, State Brass Foundry is a relic of American industrialization. Check out the family-run business' story here. Have you ever noticed that one building with a sign outside reading "Christian School"? Get hip to the journey of its other-worldly tenant. 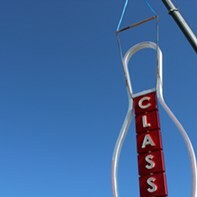 Speaking of signs, we also pay homage to great displays old and new in this special issue. Summer heat have you down? Break out the galoshes and relive the great flood of '83 here. While you're at it, give a standing O to the folks behind South Salt Lake's Children's Theatre, and hear the stories of some State Street characters straight from the horse's mouth. You'll also find a timeline highlighting Great Moments in State Street History—from JFK to KFC. Speaking of which, if all that reading has made you hungry, and you want to travel around the world in 80 plates, State Street has you covered (and so does our food reviewer). Read his picks of under-the-radar bests. And what about local car culture? From being the current home of endless dealerships, auto body shops and garages to cruising and drag racing, many think State is synonymous with the rev of a 1969 Camaro. Chances are, depending on your age, that a muscle car is the first image that comes to mind when hearing the name of the defiant stretch. Many fights, lifelong friendships and, in the case of Bountiful mechanic Lee Whittaker, marriages were started there. Keep your flashiness, U.S. Route 20. We have heartfelt bragging rights all our own.